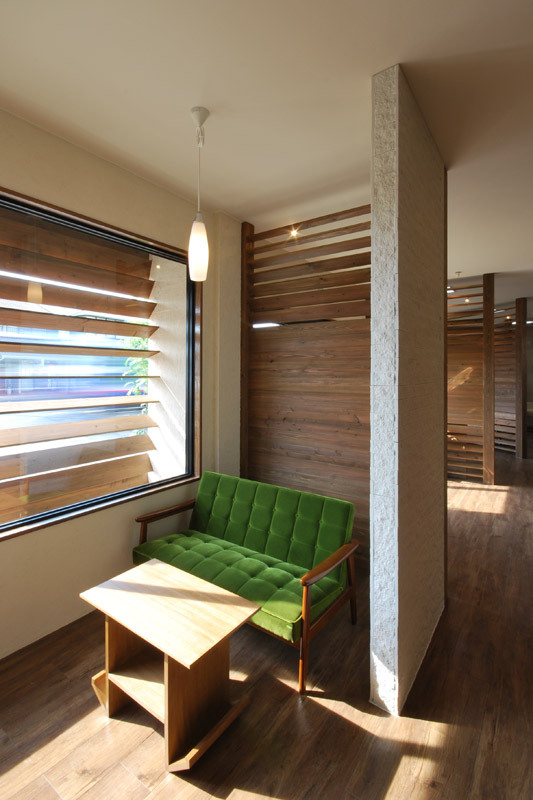 A quiet residential area amid a rich natural environment in Toyokawa City, Aichi Prefecture. 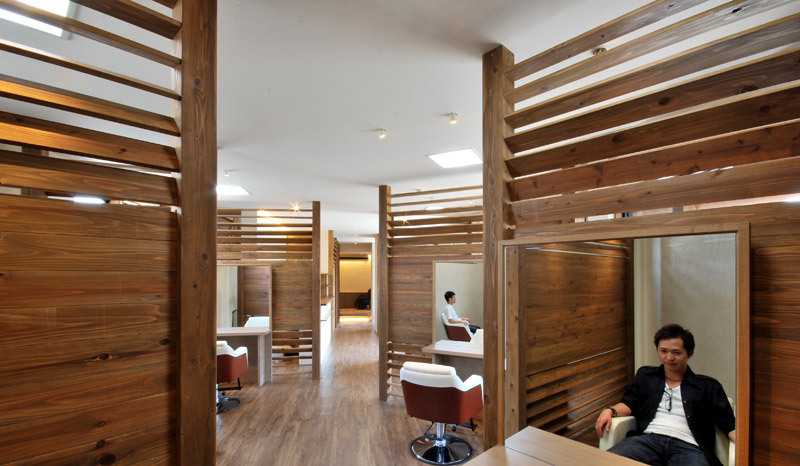 This plan is of a hair salon facing a prefectural highway which is the main community road for nearby residents. 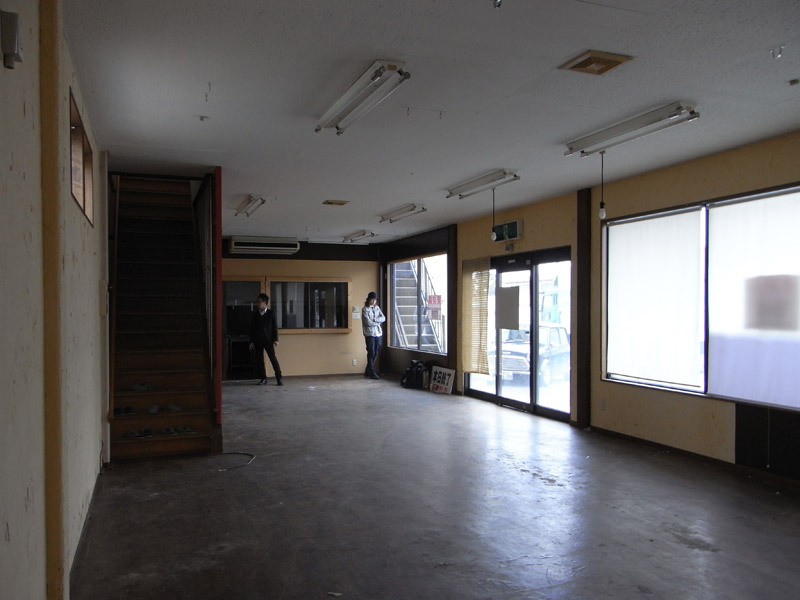 The young owner is in his 20’s and preparing to open a hair salon in Toyokawa, the town of his residence, with the goal of materializing his beauty ideals. 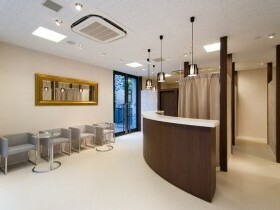 The owner’s request was to create a hair salon that is natural and calm, a place where nearby residents can casually gather. 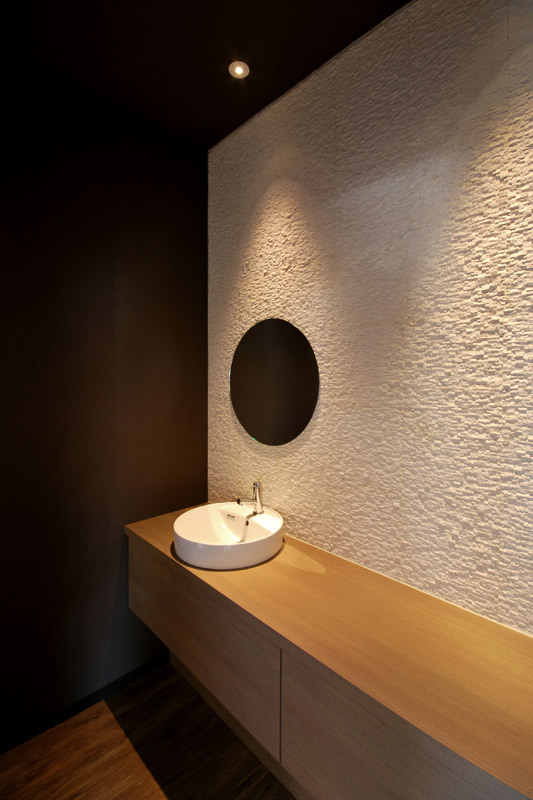 In addition, location, main target customers, existing tenant situation, indoor heating environment, cost and other issues needed to be addressed. 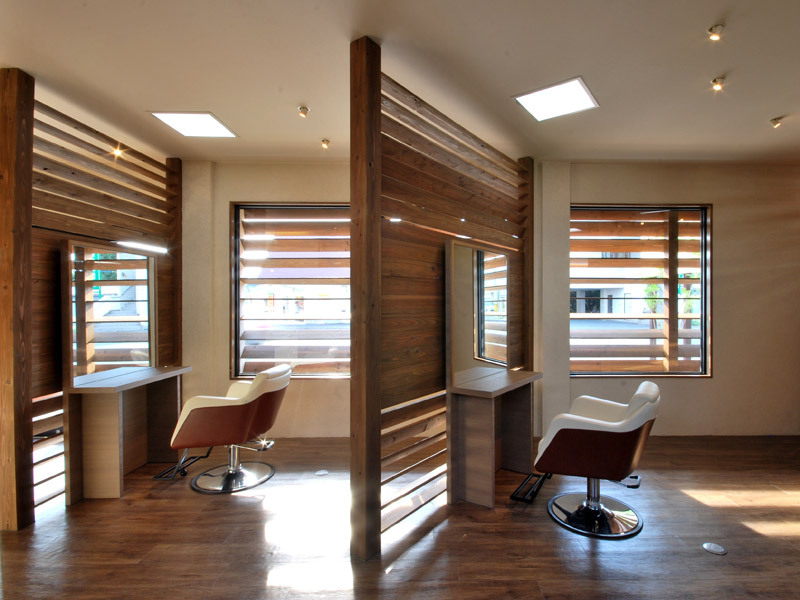 In order to come up with simplest answer to the above, and to make the salon a place where customers can feel comfortable, we sought to establish a certain rule as a solution. In particular, a rule was created for the cross section and planar surface for wooden boards with uniform width and thickness. 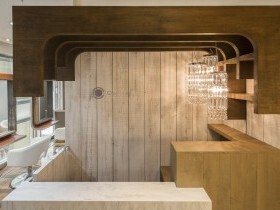 In the cross section plan, the wooden boards would be angled differently so that there would be an open view towards the top and bottom. 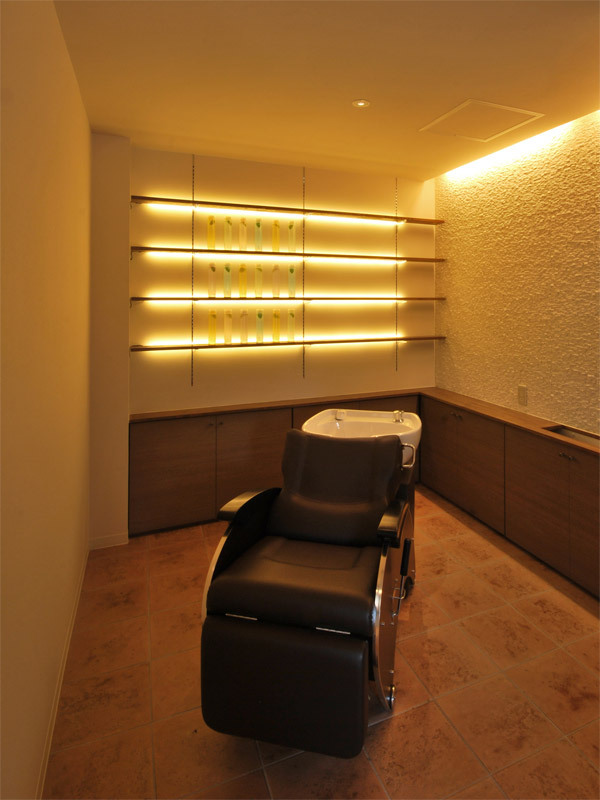 As a result, the customers seated in the salon chairs do not have to make eye contact with the other customers, and despite the limited space, the salon can have an open atmosphere through the openings and connections towards the top and bottom. 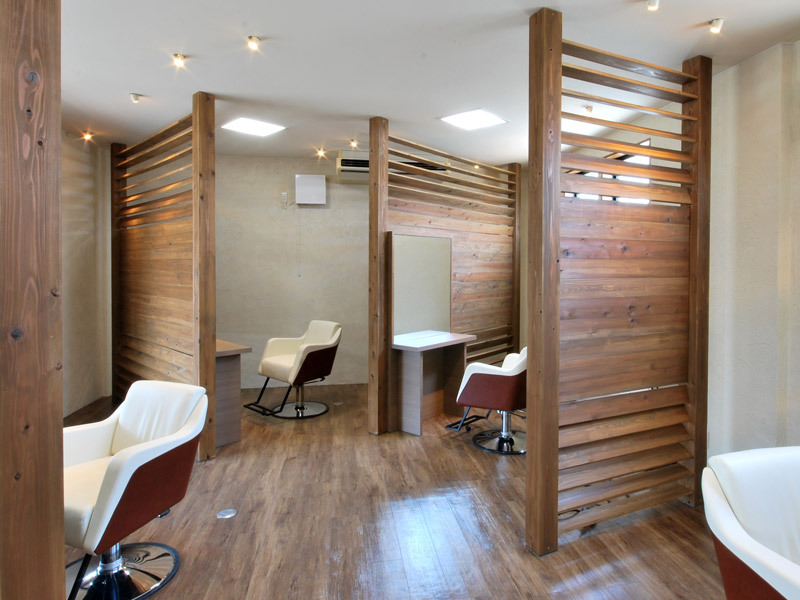 Additionally, by converting the existing air conditioning in order to keep costs down, and by circulating the air through the opening of the wooden boards at the top and bottom, the salon environment would be a comfortable one. 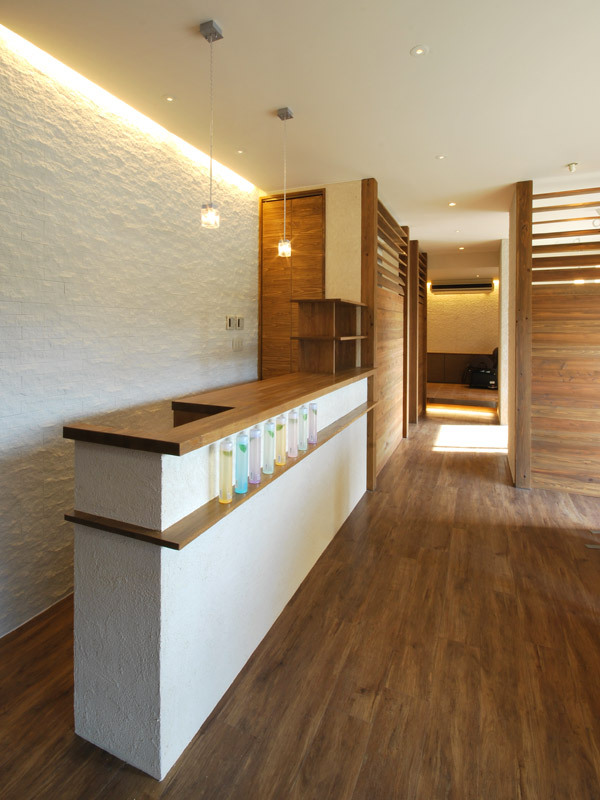 In the floor plan, the wooden walls partitioning off each booth would be angled differently to one another so as to have a narrow entrance in relation to the floor of the existing building which widens as you move further in. 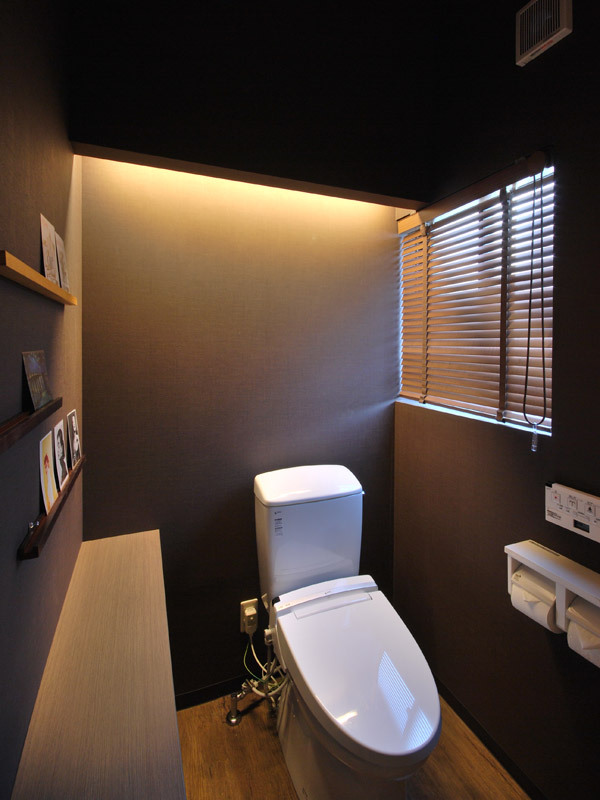 As a result, you can walk in from a narrow entrance to a wide space, where each space is connected at the same time having a private room atmosphere. 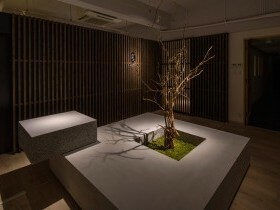 The private room atmosphere is created with consideration to the owner’s desire that each customer can relax without being conscious of others. 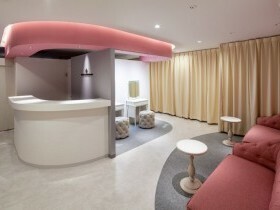 At the same time, according to this plan, the semi-private atmosphere enables the assistant to follow-up on the hair dresser without delay, which would be difficult in a completely-private space. 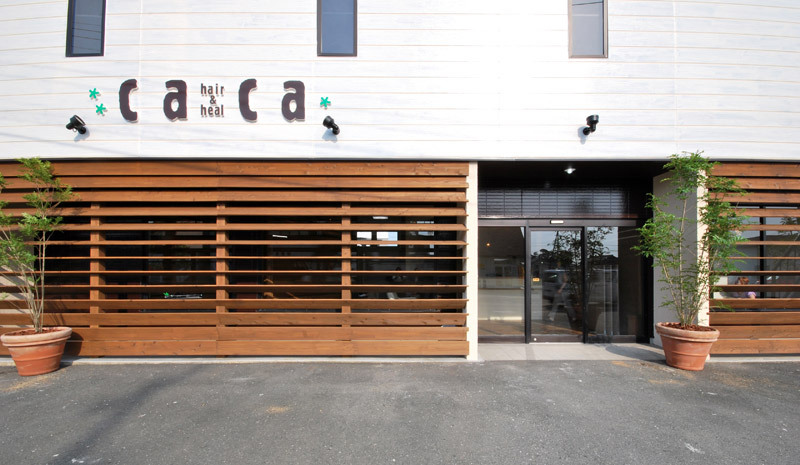 Through the simple solution of creating a cross section and planar rule for the wooden boards, a hair salon was created which was named “hair & heal Caca” by the owner. 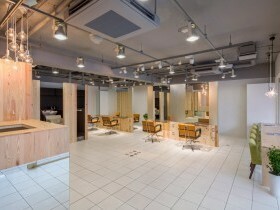 By adding “hair & heal” to the salon name, the implication is that the completed space is not just a hair designing spot where nearby residents gather, but also a location where you can forget your day to day busy lifestyle and be healed.